If your putter grip is worn from use, you can replace it yourself in several simple steps. 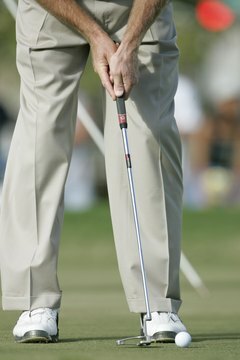 The grip on a golf putter can wear out, especially if your putter gets good use. Professionals can replace your putter grip, but your golf clubs are too important to trust just anyone with their care. You can replace the grips yourself on your putter in a few easy steps. Purchase your replacement grips and any additional products you may need. You can find replacement putter grips at your local sporting goods or golf shop. Put your putter into the tabletop clamp and tighten the clamp. Make sure the putter is vertical, with the grip pointed toward the ceiling. Wrap some masking tape around the shaft of the putter right at the bottom of the grip. On the masking tape, mark where the seam (the middle) of the grips is located for proper placement of the new grips. Use the box cutter knife to cut down the seam of the old grips and the grip tape that is underneath. Peel off the old grips if necessary. Use the mineral spirits (like paint thinner) and a cloth to remove the adhesive residue from the old grip tape. Make sure you wipe the shaft dry after you are finished. Apply some new grip tape along the area where the new grips will sit. Stop at about 1/8 inch from the masking tape. Position the opening of the new grips over the shaft. Make sure that the seam is going to be in the proper location. Slide on the new grips, keeping the material from bunching or twisting as you go. You can adjust the seam to match the mark on your masking tape, but you will have only about 15 seconds to do so before the grip tape sets in. Remove the masking tape and any adhesive residue (use mineral spirits) and wipe the area clean.